This strange galaxy has a far more exciting and futuristic classification than most — it hosts a megamaser. 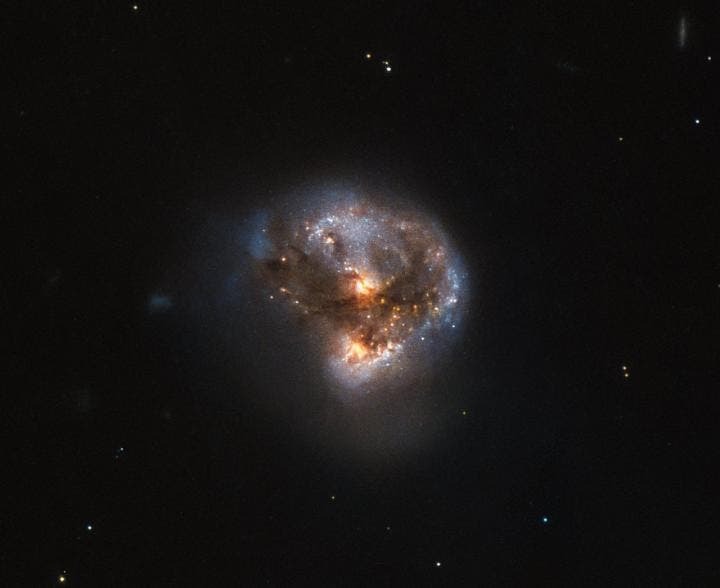 Megamasers are intensely bright, around 100 million times brighter than the masers found in galaxies like the Milky Way. The entire galaxy essentially acts as an astronomical laser that beams out microwave emission rather than visible light. A megamaser is a process that involves some components within the galaxy (like gas) that is in the right physical condition to cause the amplification of light (in this case, microwaves). But there are other parts of the galaxy (like stars for example) that aren't part of the maser process. NICMOS's superb sensitivity, resolution, and field of view gave astronomers the unique opportunity to observe the structure of IRAS 16399-0937 in detail. They found it hosts a double nucleus — the galaxy's core is thought to be formed of two separate cores in the process of merging. The two components, named IRAS 16399N and IRAS 16399S for the northern and southern parts respectively, sit over 11,000 light-years apart. However, they are both buried deep within the same swirl of cosmic gas and dust and are interacting, giving the galaxy its peculiar structure. The Super Brain –"Mutation of Human Genome Two Million Years Ago Created the Big Leap That Led To Speaking and Thinking"